Welcome to The Gratitude Giveaway hosted by Kathy of I am a Reader, Not a Writer! I hope all of you are having fun visiting the over 175 blogs that are part of this great giveaway. my blog and my giveaway! This giveaway will run from today, November 17th, until 11:59pm November 28th. I have heard great things about this book and I’m dying to read it just like most of you are. This book has a release date of November 30th so even though it is not out yet it will be out by the time the giveaway is over and I have had the time to count up all the entries and pick a winner. 1. You MUST be a follower of this blog in order to be entered to win. 2. You must be 13 years of age or older and have a vaild US mailing address. 3. This giveaway is US ONLY as I’m a college student and can’t afford the shipping overseas. I’m sorry international readers, I hope to have giveaways in the future that are for everyone. 4. 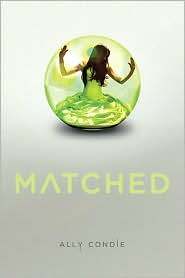 I am only giving away one copy of Matched by Ally Condie so there will only be one winner. Become a follower of Pages of Forbidden Love and leave a comment with a vaild email address. This is good for one entry. ~ +1 Add my blog button to your blog/site and leave the link in your original comment. ~ +1 Add this giveaway to your blog/site sidebar and leave the link in your original comment. The winner will be announced on my blog on December 5th. I will contact the winner in an email and they will have 48 hours to respond with their mailing address otherwise a new winner will be chosen. *I am not responsible for the book getting lost or damaged in the mail. I will be ordering this book from Barnes and Noble so I am not responsible for any damage they cause during shippping. Thank you. Thank you for stopping by and don’t forget to check out the other great blogs listed below. Jamie - I'm a guy, btw! Your blog rocks! I'm DEFINITELY a new follower! And thanks for the giveaway…been hearing a lot about Matched! Thanks for the giveaway…great title. Attractive blog. Just became a new GFC follower. Thanks for the wonderful giveaway. I am a new follower!! Great giveaway!! I am a new follower.this book sound wonderful.Please enter me in the giveaway.Thanks for the wonderful giveaway.augustlily06(at)aim(dot)com. I'm lookig forward to this book as well. I'm now a GFC follower as Tanyaw1224. Please enter me in this contest. Thanks! Wow! Way to go Lexa! Thanks so much for this giveaway =) You rock! Thanks for a chance to win this giveaway! I follow in GFC! I am a new follower on GFC and I added your button to my blog roll. I would so love to win a copy Matched!!! Thans for the great contest. Thanks for the great giveaway! I am a new GFC follower!! 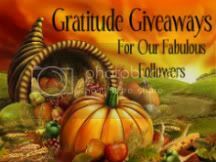 I am a GFC follower and I have the gratitude giveaways link on my blog. I'm a follower of Pages of Forbidden Love. Oooh sign me up! I REALLY want to get my hands on Matched! I'm a GFC follower. Thanks so much for the giveaway! I'm a new follower. Great blog. I am a new GFC follower. Feel free to stop by my giveaway if you haven't already, #86. Happy Thanksgiving. Thx so much! I'm a new follower! I'm a new follower of your blog and would like to read this book. Thanks. New follower here. Thanks for this! New follower here, thanks for hosting! So glad I found your blog through the hop 🙂 I've heard a lot about this book and I can't wait to read it! I follow on google friend connect and I'd love to read this. Awesome book! Thanks for the giveaway! This is on my to-read list. I'm a new follower. Thanks for the chance to win this! Love your blog color/design. I'm a new GFC follower. Thanks for hosting this giveaway. I have read great reviews on this one and have it on my to-buy list for my Not-So-Bebe-Girl Autumn's Christmas book box! Thanks for the chance to win! the posts are very quick for beginners. May just you please lengthen them a bit from next time?